Contact us: Get in touch to get involved, and engage with our chapters via Facebook. The New York Public Interest Research Group’s unique mission is to give students an array of extracurricular activities and opportunities to participate in important public policy discussions, through which they can learn a wide range of valuable skills, contributing to a well-rounded educational experience. Students working with professional NYPIRG staff help lead projects and campaigns on a variety of urgent issues. This hands-on approach teaches students skills that make them more active members of their community, enhances their academic experience, and prepares them for successful entry into the workforce. Students across the state at NYPIRG’s campus chapters, including NYPIRG’s Student Board of Directors, have made tangible contributions on the issues of civic engagement, higher education funding, consumer rights, environmental protection, mass transit, and homelessness. Since 1973, NYPIRG has provided a unique service of supplementary learning and provided countless students with an enriching and rewarding experience. NYPIRG Statement Applauding Legislative Support for New York's "Dream Act"
A college degree is a near-requisite for competing in today's job market. Yet, since the Great Recession, funding for higher education has been dramatically cut; tuition has been hiked five of the past six years, jumping $1,500; and financial aid and opportunity programs which serve New York’s most at-risk students have been under-resourced year after year. Mounting costs are not reserved to tuition. Textbooks, transportation, housing, childcare, and food expenses can be significant barriers to a college degree. The recently proposed Excelsior Scholarship is laudable, but does little to help low-income students and excludes many including undocumented students and part-time students. This is the reality New York college students face. For too long, New York has not provided adequate funding for colleges and universities, and that has had real consequences. Students are stepping up across the state to tell their stories through NYPIRG’s Higher Education Storybank project. Hear from students like Queens College’s Beena Kanhailall, who works 60 hours a week to afford tuition and her pre-law textbooks, or Borough of Manhattan Community College’s Sapphire Garris, a mother of a 1-year-old who is able to go to school because of opportunity program-funded daycare, or Buffalo State College's Shahadah Williams, who wonders if she'll have to choose between buying food or preparing for graduate school. Click here to visit the storybank where you can read dozens of stories, or filter the bank by school, students' NY Assembly or Senate districts, or by tagged keywords. Please share widely. If you would like to speak with any of the students who participated in the project, please contact the corresponding NYPIRG chapter or email NYPIRG Program Director Megan Ahearn, mahearn@nypirg.org. 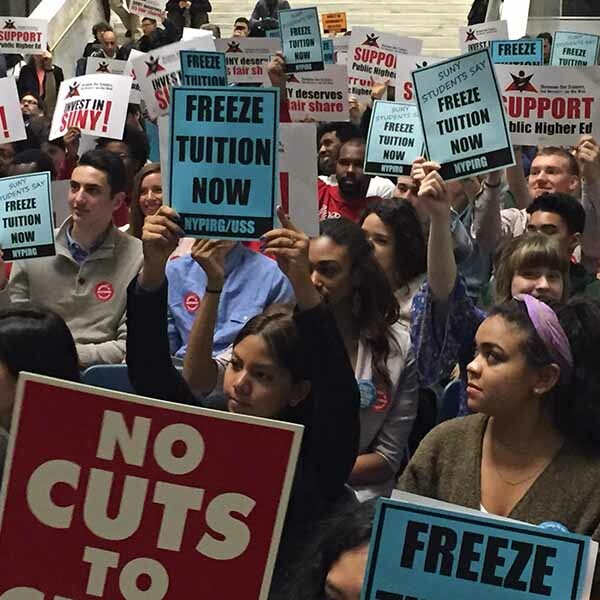 To learn more about our Higher Education Affordability work, please contact NYPIRG Campaign Organizer Emily Skydel, eskydel@nypirg.org.